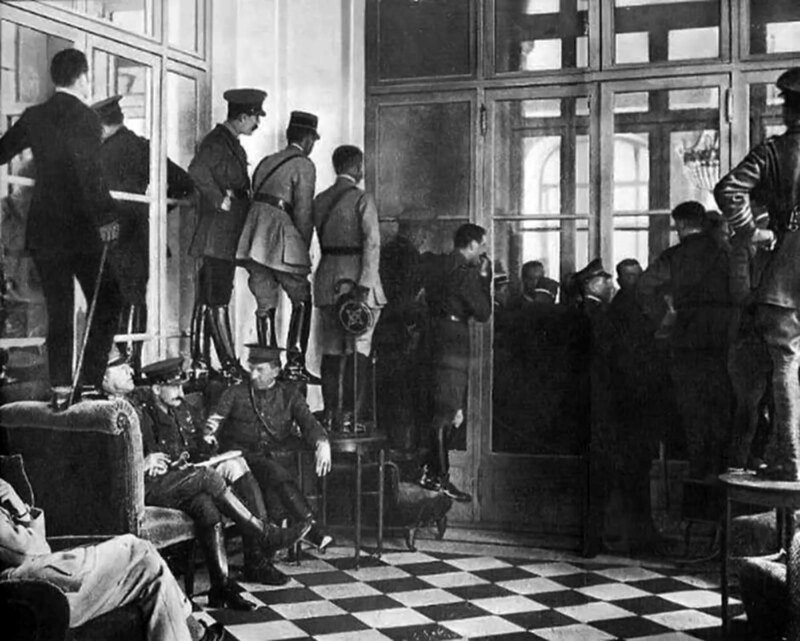 Military officers and politicians climbing over furniture to watch the signing of the Treaty of Versailles in the aftermath of World War 1. June 28th, 1919. On 28 June 1919, the peace treaty that ended World War I was signed by Germany and the Allies at the Palace of Versailles near Paris. Allied interests were represented by the ‘Big Three’: British Prime Minister David Lloyd George, French Premier George Clemenceau and US President Woodrow Wilson. The Great War had devastated Europe. Vast areas of north-western Europe were reduced to moonscapes; French and Belgian villages and towns had disappeared without trace. The conflict decimated Europe’s male population. Both sides suffered casualties on an almost incomprehensible scale. France had suffered more than 1.4 million dead, and more than 4 million wounded. In total, 8.5 million men had perished. According to the treaty, Germany was stripped of 13 per cent of her territory and ten per cent of her population; the border territories of Alsace and Lorraine were returned to France. Germany lost all of her colonies, 75 per cent of her iron ore deposits and 26 per cent of her coal and potash. The size of the army and navy was drastically cut, and an air force and submarines were forbidden. The Germans also had to officially accept ‘war guilt’ and pay reparations. “There was very little ceremony or dignity. The plenipotentiaries all walked in casually with the crowd… When they were all seated, the German delegates were brought in; they passed close to me; they looked like prisoners being brought in for sentence… The Germans signed first and then all the other delegates… When the signing was finished, the session was closed, and the Germans were escorted out again like prisoners who had received their sentence. Nobody got up or took any notice of them, and there was no suggestion that, the peace having been signed, any change of attitude was to be begun. Looking back, the whole impression seems to me, from a political point of view, to be disastrous… As a matter of fact, what was really being done was not merely to make peace with Germany, but to sign the Covenant of the League of Nations, but of this no one seemed to think… Just the necessary note of reconciliation, of hope, of a change of view, was entirely wanting”.